Hey guys, I’m excited to be sharing a review of another fun product today. Artist had a great time with Orphs of the Woodlands at Tangletree from Star Toaster. 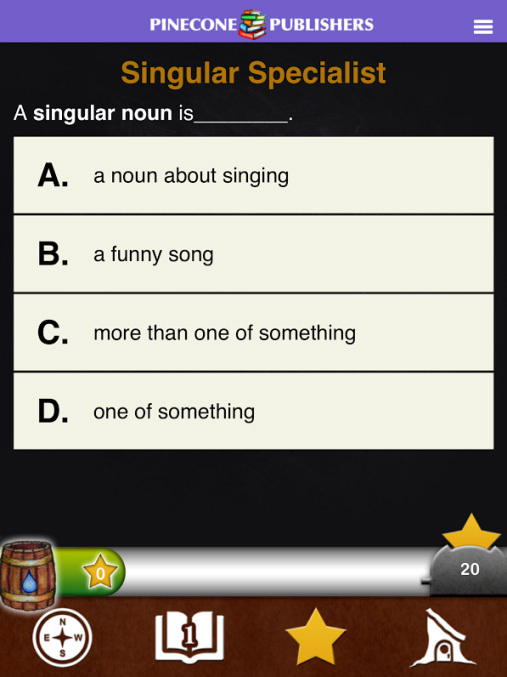 Throughout the story they can click on various words to find out more, such as the definition of vast, what a homonym is, and character building lessons like “Learn to listen & listen to learn.” The app includes simple lessons in math, science, grammar, vocabulary, thinking skills, character, life skills, and the arts. Kids can also do jobs to earn stars that are used to buy things for the orphs. Completing jobs includes a variety of activities from learning about pulleys to exploring impressionism. The app is for ages 7 and up and I think any child old enough to read well would be able to use it. As soon as I downloaded the app for Artist (age 9) she dove in and didn’t come up for air till 3 hours later when she’d finished the story and all 136 jobs! She didn’t actually complete every lesson, she was often too caught up in reading the story to click on the words that would lead her into a short lesson. Having earned all the stars she could through jobs, and not seeing any other way to earn them, she asked me to sign-up to be notified when the next adventure comes out, and then she was done. I was pleased with the content. Artist is an avid book-lover! She devours good stories like nobody’s business, and this was no exception. However, I think her excitement to keep reading to find out what happened next actually prevented her from fully experiencing everything the app had to offer, since, as I mentioned before, she didn’t often click on the words within the story that would have either opened a pop-up with the definition of the word, sent her to another page that contained information for her to read or a short video, etc. I think the app would be awesome for a kid who maybe doesn’t super love sitting down to read just for fun. Reading as the means to unlock tasks you can do in order to care for your orphs makes it more about playing a game than sitting down with a book. And apparently caring for the orphs is a really appealing motivator. At first, when Artist had finished the jobs she had available, she kept checking every few hours to see if more would pop up. I finally had to poke around for her until I found that her progress listed her as having completed all the jobs. 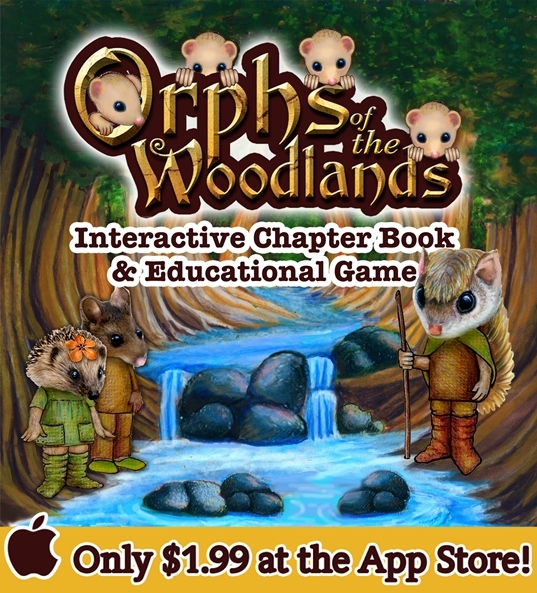 All in all, I’d recommend Orphs of the Woodlands at Tangletree to a friend. Check out what other reviewers are saying at the Schoolhouse Review Crew link-up! Hi Heather! 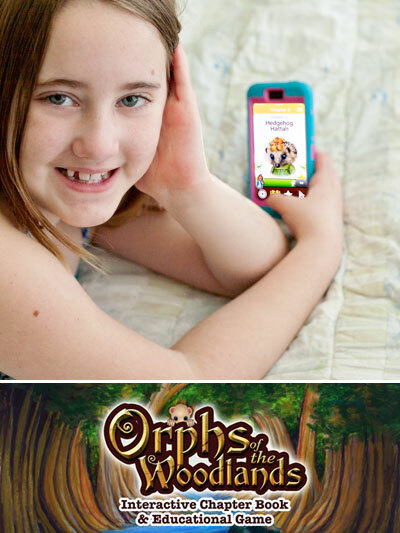 Thoroughly enjoyed your kind review of “Orphs of the Woodlands. Loved the photo of Artist holding the app! Sorry for any confusion about the age range. Apple requires you to pick either 9-11 OR 6-8. Our app is for 7 and up, so we don’t exactly fit either category. You said it well, “a child old enough to read would be able to use it.” Reading about Artist was a delight. Thank you for taking the time to review “Orphs of the Woodlands”!